3 Bedroom Detached House For Sale in Woking for Guide Price £525,000. 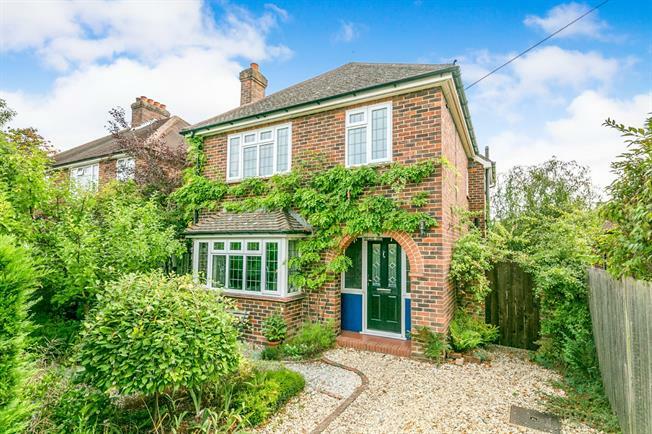 This attractive 1930's detached home is set back off the road and has great kerb appeal. Enter in to a bright and spacious entrance hall to discover a beautifully presented home sympathetic to the period. The lounge boasts solid wood flooring, a feature fireplace and a bright bay window, and the dining room to the rear is flooded with natural light thanks to the large French doors flowing out on to the Indian stone terrace. The traditional kitchen feels homely and is fitted with modern appliances for the convenience of modern living. Upstairs, a large landing leads to two double bedrooms, complemented by a third junior room which all share a spacious and modern family bathroom. Outside is a carefully landscaped garden containing a large brick outbuilding and a separate vegetable plot to the rear.